…and Hula Girl looking at home in Hawaii some 2,225 miles later! Thanks to Sea Bags for the cool swag! 25 miles to go, and I’m beyond proud of our team. On most days I might have a beer after work. Tonight I’m going to have a Mai Tai! http://sailing-jworld.com/jworldwp/wp-content/uploads/2015/01/Header-Logo.gif 0 0 jworld http://sailing-jworld.com/jworldwp/wp-content/uploads/2015/01/Header-Logo.gif jworld2013-07-23 01:31:002015-01-05 19:25:0525 Mile Check-in!!! We started off in Los Angeles with a crew of nine: three J World coaches and six sailors who – for the most part – had never sailed together before, nor sailed on a boat like Hula Girl. So our first challenge was to create a real team out of the disparate group. Then, as if that weren’t enough, an unlucky break in the first day (getting stuck in a windless hole) put before us another mountain to scale… we needed to catch up to our fleet. But what a year to be behind… the racecourse this time was uncharacteristically shifty and challenging…. 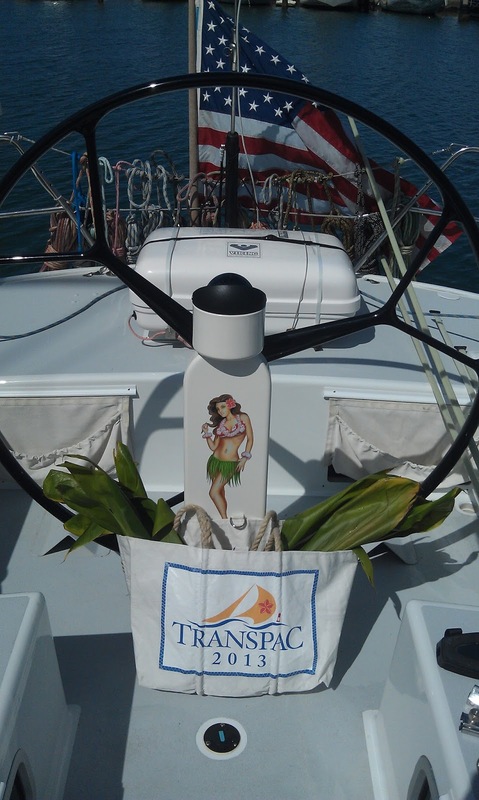 it was a tough Transpac year. I’ll cut to the chase: now, after we executed perfect gybe and have the finish line in sight, I can definitively say that this group – no, this TEAM – has truly impressed me with the their ability to conquer these goals…. and, more than that: they impressed me with the style of how they did it. Everyone busted their backs, driving, trimming, grinding, and we hammered back into the fleet. Seriously impressive speed, smoothly executed maneuvers, and (put simply) a well-sailed race. We picked off almost half the fleet, and had the rest looking nervously over their shoulders.. And we still have a shot at getting past a couple more boats… it’s too close to call. Another reason it’s a great race: 2225 miles across an ocean, over 11 days of non-stop racing, and we are going to have some close finishes. Good times indeed. What makes the races to Hawaii truly GREAT races is the fact that the scale always tilts, at the end of the day, towards the positive…. the sailing, the people, the great challenge of crossing an ocean. 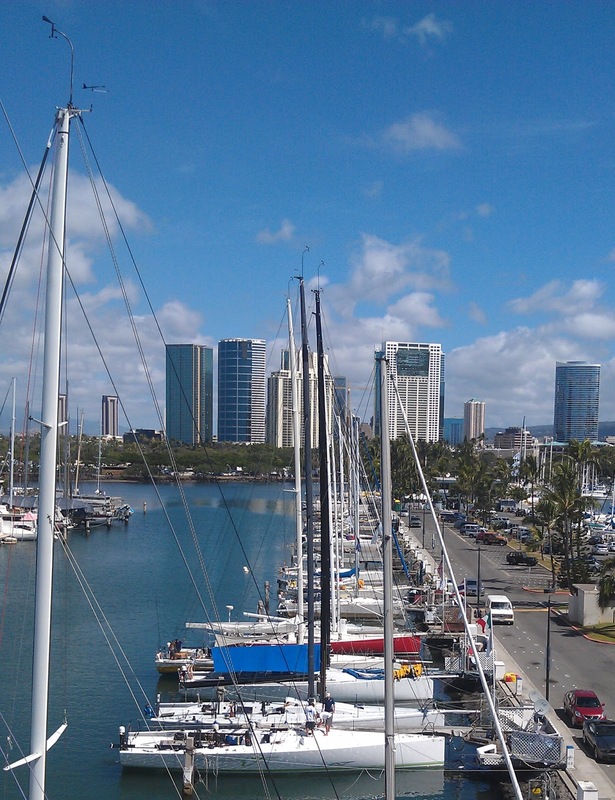 And I can say that this Transpac was a great race. Thanks to the race organizers and volunteers. Thanks to J World team supporters: Atlantis Weathergear, Team McLube, Expedition Software and Almar Marinas. Thanks especially to our friends and families that support our crazy ambitions. But most of all, thanks to the crew of Hula Girl, a true bunch of (now certified) Hulagins with which I’d be happy to sail again… anywhere, anytime. Thanks tremendously, guys! I’m going to go outside and enjoy the final push to Honolulu right now… we are about to punch into the breezy Molokai Channel and reach down to the finish line off Diamond Head. And it feels nice. http://sailing-jworld.com/jworldwp/wp-content/uploads/2015/01/Header-Logo.gif 0 0 jworld http://sailing-jworld.com/jworldwp/wp-content/uploads/2015/01/Header-Logo.gif jworld2013-07-23 00:29:002015-01-05 19:25:11Land Ho! We hate Fridays as of late. Last Friday morning, we sat in a hole off San Nicholas Island and watched our fleet sail away from us, taking a 60 mile lead which we have been hammering at since then. 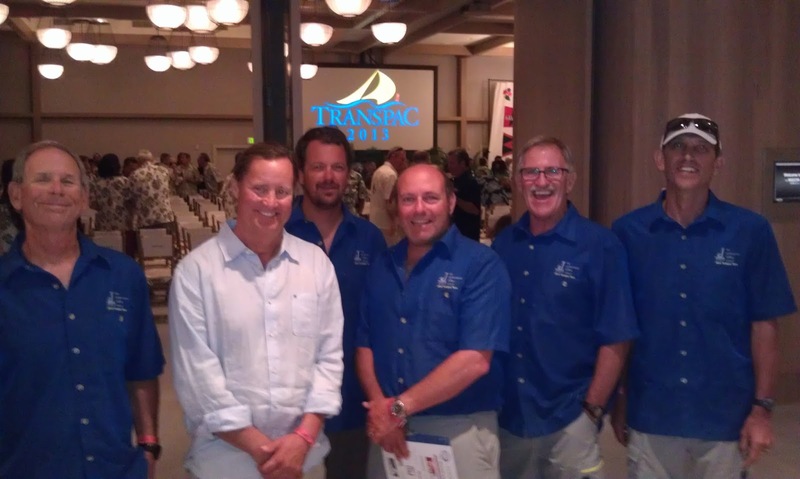 We were in last place in the 2013 Transpac, racing to Hawaii at that point. Since then we managed to pick off boats every day, and were sitting in 6th as of yesterday morning with a couple more boats in our sights. The breeze was great thru the night and the moon was spectacular. At the 6am position report on Friday, we were about 700 miles from the finish. Mid morning, things started to get weird. A line of squalls moved thru the area, and in the vortex behind them, the wind went funky. It died then shifted to the south, then died again, and shifted to the SE, then to the E, then I can’t even remember…. and so on for some three hours. Our team rocked it, changing sails to each new wind and keeping the ‘Girl moving. Finally, after a lot of hard work, the new breeze filled form the Northeast and we were off again. It was pretty painful to be going so slowly for that long, and we were hoping that our competition might be dealing with the similarly unstable conditions. Unfortunately, at this morning’s roll call, we found that it looks like we were likely the only ones who chanced upon that unstable area… well, maybe the SC52 Relentless did, since they were somewhat nearby and they lost a lot of time too. The ‘Pacific Glue Pot’ is what Geoff named it. Beyond the lumps we took, it’s been stunning out here. Beautiful and mild weather, a fun boat, and a great crew. The moon is approaching full and the skies have been clearing up, so nights are fantastic. We are just past the breakfast hour at the moment, with Jimmy driving and Mario trimming. It’s starting to get warm out there, feeling pretty tropical. At least with the lighter breezes, we care able to open hatches and get some nice breeze thru the boat in the afternoons. Lots of flying fish, a couple of lonely seabirds out here in the big blue… and that’s about it. We’ll probably start seeing more boats as we get into the bottleneck approaching Hawaii, but the fleet is still really spread out. 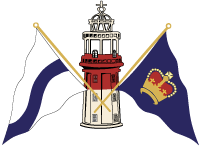 http://sailing-jworld.com/jworldwp/wp-content/uploads/2015/01/Header-Logo.gif 0 0 jworld http://sailing-jworld.com/jworldwp/wp-content/uploads/2015/01/Header-Logo.gif jworld2013-07-20 17:15:002015-01-05 19:25:13Freaky Friday(s), flirting with the "Pacific Glue-Pot"
Halfway across the Pacific, that is. About as close to the definition of “middle of nowhere” as you can get. The nearest patch of dirt is over 1000 miles away. In fact, you can’t get any farther from terra firma anywhere else on the planet. 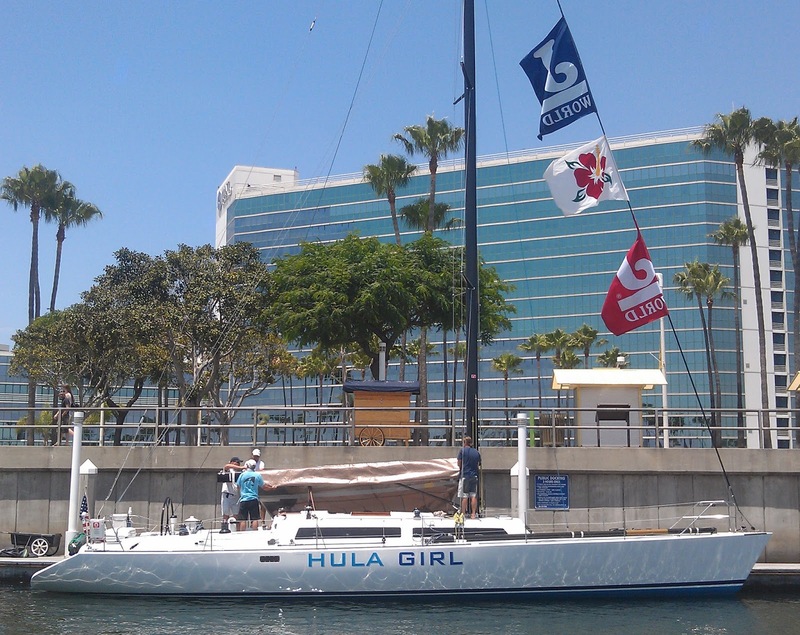 That’s where we are aboard J World’s Hula Girl, competing in the 2013 Transpac. The morning roll calls have been bringing good news for our hardworking team. We’ve been steadily recovering form a bad (horrible?) first day and the now legendary hole-off-San-Nicholas-Island. We got past Chasch Mer. We got past Bodacious. And we made time on every other boat in our fleet. We are reeling them in, and we have every intention of kicking, clawing, staggering back into this race! Oh, and we are having a great time doing it. It’s been amazing out here…. The water is a shade of blue that words cannot do justice to. The skies are big and blue… a wholly different but equally mesmerizing blue. The sunsets? We’ll as Don put it earlier tonight, momentarily emerging from a cockpit conversation to admire the view, “Wow, that’s a beautiful sunset. Didn’t we already see one tonight? Or was that last night?” Tough to tell. The hits keep coming. The breeze tapered off yesterday afternoon to a mild 10-12 knots, and our pace slowed. And so it remained into the night. In the middle of the darkness, we crossed gybes with another boat, maybe 100 yards off. Not really sure who it was… likely one of the earlier starters that we are catching up to. Then, early in the morning, our anticipated shift came, earlier than expected, and we were free to gybe towards the south with a good angle, and hopefully towards more wind/pressure. Most of the day was spent in 8-11 knots, pretty slow going, but we worked it pretty hard so it will be fun to see where we are in the morning. This evening at sunset we had a celabratory toast in honor of the halfway point, then, as if on cue, our breeze came back. 17 knots, just like that. We shifted gears, and were quickly rumbling along towards the Islands. It’s now midnight. Breeze is 18-20 knots, we are skimming along in very flat seas at about 12. The waxing moon plays off our port bow, a perfect light for the stage we are sailing across. Dave just got off the wheel, and Tommy is now driving. Don went on watch just moments ago. Mario’s watch ended almost a half hour ago, but he’s still out in the cockpit. It’s pretty much an amazing evening out there, and I can’t think of many places I’d rather be. In fact, I’m going to leave the computer here in the nav station to the project of downloading the new weather faxes, and I’m going to go join them. 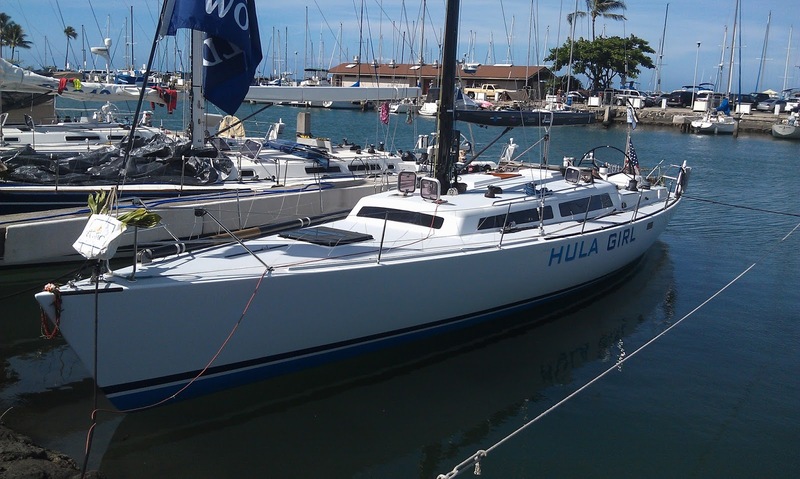 After a horrible escape from coastal California, we have been rumbling along aboard Hula Girl in the 2013 Transpac. It’s been an interesting and funky race, and it’s going to remain that way for a bit, or so it seems. For our fleet, after carrying light spinnakers before we drifted out of sight of the start line, we finally got into some good breeze, mostly from the north… and so it has remained. Usually, as we cross the ridge and get into the SE corner of the Pacific High, the breeze pretty quickly shifts around to the NE and we start the long VMG run to Hawaii. But not so this year. It’s been super reachy. A couple days with the Jib Top, then we are pushed into day three with the 1A spinnaker, a flat cut reacher, and our staysail. Good news for some of the other boats out here that like the reachy stuff, but our ultralight Santa Cruz 50 is a bit tender and excels more in the downwind mode. Early this morning, the breeze shifter around a bit and we finally set the big 2A spinnaker. But we had a couple awesome days of sailing. Mostly 15-8 knots, with breeze increasing to 18-22 in the evening, and we have been cutting it up on the Pacific swells. We had one snorting, chuffing 30 knot puff and Tom got the Girl up to 19.4 knots, top speed so far this trip. Pretty comfy aboard, but a bit noisy when we really get moving, and everyone is getting used to that. Had a wonderful dinner of home made Lasagne (ok, ok, so it was freeze dried). Everyone has been doing a great job and making significant improvement… which is good since the nights are still pretty dark (there is a bit of moon, but lots of cloud cover). Mario at the wheel right now, with Dave trimming, James grinding, and watch captain Geoff providing parental supervision. It looks like the “big boys” behind us are diving pretty far south… I’m curious how much of that is a push for boatspeed (cracking off a bit really makes a big difference) combined with the farther north than usual wind direction, or how much of it is a result of their expectation of more wind down there as the week progresses? We’ll see…. it’s going to remain a bit strange. There is a big ol’ blowing low pressure north and west of Hawaii that looks like it might affect the winds a bit, and a developing /expanding high near the racecourse…. but the computer generated forecast models (‘Gribs’) and the meteorologists seem to be disagreeing on the precise impact to our winds. I’ve got a guess, but I’ll leave it at that for now! pretty much every boat in the fleet. would punch out of the light stuff, and we wanted to be one of them. miles still to go, we are resolved to chase them down! last night, and have been blasting along in 15 knots from the NNW. feelings about our odds of making up lost time! Ok, it’s summertime in California and to fans of offshore racing, that means it’s time to get ready for the epic race to Hawaii… TRANSPAC! 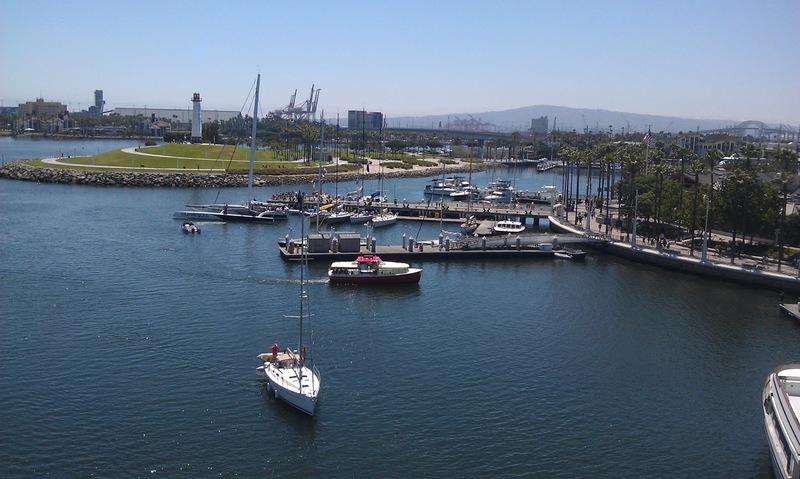 Our J World team of coaches is now in Long Beach getting ready for our start this coming Thursday. We have a fantastic team of six sailors and three coaches aboard Hula Girl, and we are lining up against a truly world class fleet. Not only do we have boats ranging from a 70′ tri and a 100′ super maxi, but we have a long list of top tier rocketships. Our class alone has five Santa Cruz 52s and four Santa Cruz 50s making the crossing, and it is sure to be hotly contested! 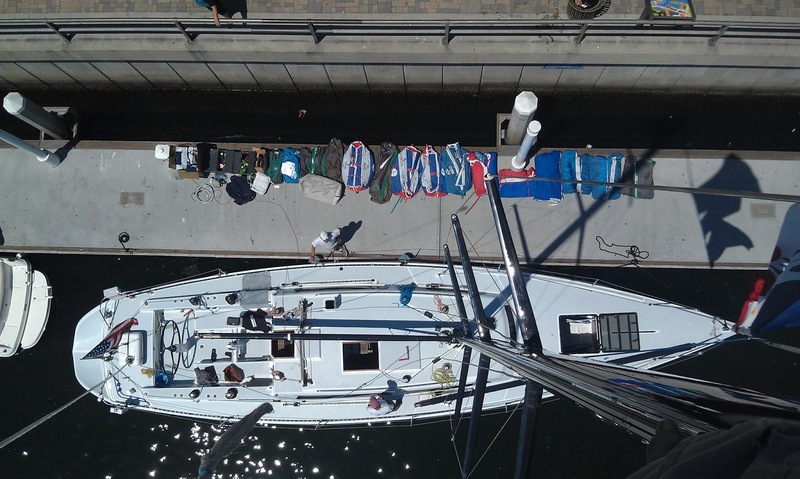 Hula Girl from aloft during a rig check… all those bags along the dock are all our sails. The full racing inventory includes 18 sails! Part of the trick is to take a good look at the weather and leave as many as we can behind (some weigh 50 pounds or more) and every little bit that we can make the boat lighter really helps! For more about the race, go here. For more about how to join J World on events like this, visit here. And stay posted to our blog for updates from the boat during the race!! http://sailing-jworld.com/jworldwp/wp-content/uploads/2015/01/Header-Logo.gif 0 0 jworld http://sailing-jworld.com/jworldwp/wp-content/uploads/2015/01/Header-Logo.gif jworld2013-07-09 03:46:002015-01-05 19:27:13TRANSPAC!